The prime time to fish Tofino is upon us once again. There is fun to be had this time of year no matter your experience or timeline. Whether you choose to fish an afternoon or multiple full days, an unforgettable experience awaits you. 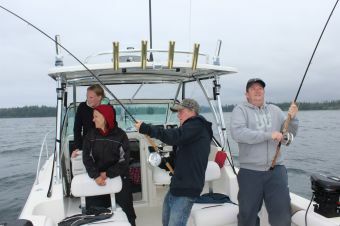 An afternoon on the water is a terrific introduction into saltwater fishing. During the months of June, July and August we have great access to salmon often in the calm waters of Clayoquot Sound. All fishing equipment is included and we have crab traps out fishing in the Sound. Morning half day charters are also offered; typically we focus on one species (Salmon or Halibut) however there may be opportunity to fish a bit of each. 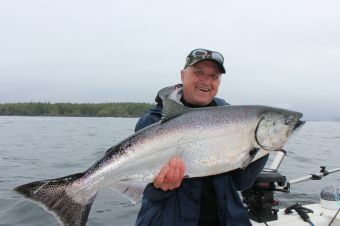 For the avid angler a full day charter optimizes our opportunities by allowing us time to access the full range of options available in the Tofino area. 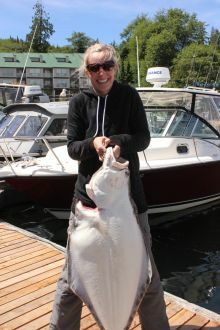 On a typical full day charter we spend time fishing salmon and halibut. As we offer private charters your group can work with your guide to plan the day that best suits your desires. Another option is to spend a day bottom fishing the highly productive reefs to the west of Tofino where Lingcod, Rock fish (Red Snappers) and halibut are plentiful. This is a great option as a second or third charter day. Tuna options are available during the second half of August and September. Please give me a call for further information. Follow us on twitter @TFG_fishing for live updates. Now is also a good time to mention the fantastic fall fishery on our freshwater remote river drift. This wilderness day trip is sure to supply ample adventure and the chance to catch and release trout and Coho (Silver) Salmon. Have a look at our Freshwater page, please give us a call if you would like further details or would like to check available dates.